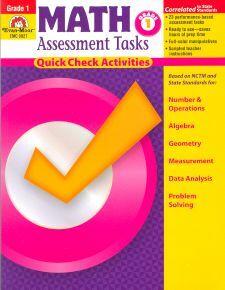 Math Assessment Tasks is an award-winning resource containing standards-based assessments that are ready-made and easy to use. Colorful task cards and sorting mats engage students while you monitor their skill acquisition. Assessments are based on NCTM strands: number and operations, algebra, geometry, measurement, and data analysis and probability. Scripted instructions make administering each assessment task easy for parents or classroom aides.